This season will be the last for one of the best shooting guards to ever play our game. There has been so much written about his departure from the NBA. Every player is viewed differently from the eyes of the person evaluating them. No one will ever please everyone as it’s an unrealistic thing for anyone to do. Everyone that’s played or coached with/against him has their own Kobe moment. Young players globally should cherish the last months of his career as he’s one of the last of the old school players that bring an old school attitude of the game with him. Everyone likes to comment on the athletic ability that he had to posterize opponents that he dunked on or the shots that he would make out of a video game with 3 defenders draped all over him as he fades away for a 26 foot shot. To me it’s his overall body of work that he built from a very young age to now is what young players should try to emulate. 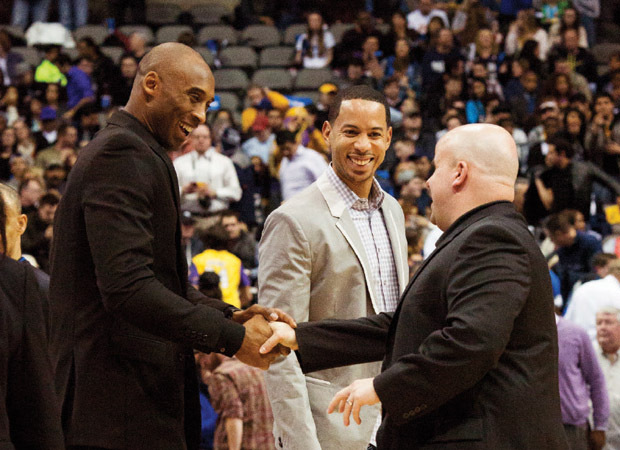 Before joining the Dallas Mavericks in 2013 as their Director of Player Development I worked for Kobe for 4 years ( 2009-2012) serving as an advisor to him as a strategic game management coach giving him scouting reports on opponents as well as evaluations after every game that he played. I’ve studied him closer than most on what made him successful throughout his career from age 16 to present day. My message to any young player thinking that they will be the next Kobe is … I doubt it….. Most players who want to emulate great players only see the player for the moves that they do on the court and not their whole body of work that brought them to be superstars. No one just shows up in the NBA and becomes a star based on natural talent. It’s a culmination of many traits that brought them to greatness. Most young players fail in our sport because they don’t take the time to formulate a plan of attack to become great. This article is to give you a little background about some of the attributes that made Kobe ….. Well Kobe. One of the first stories I ever heard about Kobe is from one of my best friends Dave Hopla(Assistant Coach Detroit Pistons) who worked Kobe out to prepare him for the NBA Draft. Dave would work Kobe out at 6 AM every morning and usually be there waiting for him. An 18 year old McDonalds All American top high school player in the country getting to the gym before the coach that was working them out prior to 6AM. The first time I ever worked Kobe out was in California in 2007. I got picked up at 4:30 AM and arrived at the gym at about 4:50 and he was there waiting on me for a 5AM workout. Every dealing that I’ve ever had with him punctuality was his calling card. When it’s time to work it was time to work. He took every workout or meeting very seriously as it was one more thing to make him the best at his craft. It started with the seriousness that he took his training and early to everything was the indication that he is dialed in. Prior to joining the Mavericks I worked with a lot of top high school players in the county. The attitude was shifting towards players taking the opposite approach, that it was a gift for coaches to work with them and being on time was such a struggle. Coaches that I speak with throughout the year always complain that young players don’t care about punctuality and that’s the first in a laundry list of problems that there is in the grassroots level of our game. Kobe’s work ethic is second to none. There are countless stories about his blackout workouts that no one but him can finish. His workouts that I’ve been a part of are one of the most simple and fundamental that I’ve ever seen. The countless repetitions of simple catch and shoot shots until it feels good is what I remember most. He didn’t cover a hundred different things, but he maxed out his reps at skill sets that he used at a high percentage. His game was all about simplicity and reading a defender. The flashy 3-4 counters that he makes in crutch time to get a shot off was very rarely practiced. I asked him one day about a particular move and he didn’t want to work on it, but what he did was work on each part of the move individually without putting it together. He told me that since he practiced each facet so many times that if the defender takes something away that once he practiced counters so much that he could make those series of moves without even thinking about them. If you watch Kobe throughout his career in the flow of games there are a lot of shots that were simple spot up or one jab jumpers. He can catch the ball on the block feel that a defender is favoring one shoulder and simply go over the other one to get his shot off. His game is mostly about playing chess and not checkers. In simple terms he waits for his defender to make a mistake and he makes him pay for it. Watching young players workout on youtube these days there is so much waste of time in their preparation working on impossible moves that they will never shoot in a game without a coach retiring on the spot or pulling them out of a game. The game isn’ meant to be selfish working on outlandish 7 dribble spin fake , step back shots. Work on being simple, work on being able to help your team. Work on being a consistent shooter, have the ability to go one dribble in either direction, be able to finish with either hand. Emulate the simplicity of players like Kobe not the complex shots that only a 6’6 freakishly long and athletic freak can do. Not every workout that I put Kobe through was a marathon. There were times he wanted to get certain things accomplished. With that being said anything that we done was done at game speed, hard, and he maxed out repetitions. Learn the skill, break it down, make the correction, and then rep it out at a game pace. Everything he does is at game speed it is a mindset that he’s developed since he was 10 years old and now in his late 30’s is still his calling card. HIs work on the court to get him prepared has been well documented, but his preparation off the court is second to none as well. In the off season his daily routine started before the sun came out and finished after the sun set. The physical is the obvious part that players relate to, but the mental side of studying the game and studying his opponent is what sets him apart from anyone that is trying to emulate him. Kobe studies game film to critique himself constantly. It could be a change that needs to be made on an angle of a cut or a drive or could be that his jab is an inch off. He also wants to know EVERYTHING about his opponents. He tracks what their strengths/weaknesses are. He wants to know statistical breakdowns on where they want to go and where they don’t. Where on the floor are their weakest points. He wants to know this about not only the player(s) that he is guarding but everyone. He is a student of the game and spends time getting to know his opponent. Young players need to do more off the court preparation. Taking care of their bodies, getting rest, proper diet, etc. Studying game film is something that you may not be used to doing now, but will need to do at higher levels as you get older. Get in the habit of trying to do this to know yourself, but also your opponent. You read about so many players getting into it with coaches for one reason or another. Look everyone gets frustrated with their coaches being all over them, but at the end of the day respecting authority needs to be a staple. Like most great players, Kobe wanted to be coached and corrected because in the end it was for his betterment. You never read about him blasting any of his coaches on losing streaks or second guessing things. At the end of the day all players at one time or another will get frustrated, but it’s channeling that frustration and communicating at a civil and mature level is the key to that. I’ve never met a coach that isn’t want to win. They correct players because they want to put their teams in position to win every night. A player may not see eye to eye with a coach, but at the end of the day the coach is in charge and you have to embrace being coached. Everyone wants to do things that they feel are right, but respecting authority and those who are in charge is a way of life. You will play for a coach at every level that you play and getting along and having mutual respect is key to being successful. Everyone wants to be great, but most don’t want to take the steps to get there the right way. You read about players that transfer high schools and college so many times because they don’t get a certain amount of touches, shots, or minutes. Everyone wants to be a star, but sometimes it takes time to grow to get to that level. Early in his career Kobe wasn’t just handed a ball and got 30 shots every night. He had to earn every minute that he got an the respect of his coaches and teammates to become an eventual contributor, starter, all-star, and eventual MVP. He didn’t become a full time starter until year 3 of his career. He played behind veterans and earned every minute that he could get. He didn’t ride the bench his rookie year averaging 15 minutes a game, but there was a guy who had the ball in his hands his whole career heading up to the draft and has always been his team’s franchise player playing less than 20 mins a game. Not only that he had to play in a system that didn’t run through him. He had to make basketball plays without the ball in his hands with cuts, screens, defense, and energy. Young players coming up in the grassroots level would really struggle with growth and having to sit behind people when they were used to being a star. Embracing and buying into the process of development is what prepares you to be great. Look no one wants to sit on the bench. Everyone has an ego and wants to be the best at what they do, but there are stages in your career/life where you have to take a back seat and learn from others that are in front of you. Earning your minutes and that equity is a great learning tool that one of the best in our game had to go through. Without asking him I bet that helped him develop even more than playing 40+ minutes a night right off the bat. Having mature professional veterans to play behind and learn from are great tools in development at any level. Embracing and buying into the process of development can’t be overlooked. This to me is what sets Kobe and Michael Jordan apart from 99.9% of other players is that they dominated on both ends of the floor. It is easy to bring all your focus and energy on the offensive end of the floor. Taking pride in your defense is something that will help you dominate games without the ball in your hands. Kobe has been named NBA All Defense 12 times in his career. That means he was the NBA’s top 10 defender for 12 times. 9 of those 12 years he was FIRST Team All NBA Defense. For 9 years he was the top at his position in defending in the NBA. That is an impressive feet. He didn’t just show up and decided he wanted to guard people. It was a mindset that he developed in the off season. I remember after working him out back in 2007, asking him if he wanted to workout the next day, he told me that he was going to workout but without a ball in his hands. Two Hours of nothing but defense. Slides, Rotations, Closeouts, Post Defense, and Footwork. That is dedication to being great. I’ve yet to see any other player at any level spend 2 hours trying to perfect their defense. Usually they do it in practice or by playing but to do it on your own working on defense is very impressive. Players need to take pride at any position in being able to stop your opponent. There aren’t enough players that take pride in that. The game is played at both ends of the floor and being able to put your team in position to be a championship team will be decided on their ability to make stops on defense. Take pride in getting in a stance and being in position on and off the ball to help your team get stops. This article wasn’t about bragging about my position that I held with Kobe. It’s main purpose was to show players about the controllable traits of one of the best ever. Having a mindset of preparing yourself to be great is the most important trait of any player in any sport. It’s easy to go on youtube and watch gray player’s moves and try to emulate them on a court. That’s what most of the young players in our game do and that is why they fail and never live up to their true talent level. To be great at anything you need to have a plan of attack. There will be setbacks and there will be adversity. That is part of the process. Greatness isn’t handed to you. There are very few shortcuts that you can take. There is plenty of season left to watch Kobe’s games. When his time is finally up he will go down as one of the greats to ever play basketball. But he will also take with him one of the most fierce competitors ever to compete. I hope as many young players as possible can learn something from his career outside of the highlights.